Ultrashort pulsed (USP) lasers for machining have really taken hold in recent years. Walk around any of the big laser shows like Laser World of Photonics or Photonics West and you’ll find USP laser vendors in abundance. The technology has also been proven in industry – in 2013, the German Future Prize was awarded to scientists from Bosch, Trumpf, Jena University and Fraunhofer Institute for Applied Optics and Precision Engineering for their work on turning the USP laser into a production tool. At the time, Bosch was using ultrafast lasers both for making sensors for monitoring exhaust gases in cars, as well as for drilling holes in spray nozzles for gasoline direct injection engines. Other areas where these lasers are used include electronics production, making precision medical devices like stents or cannulas, and cutting brittle materials like chemically strengthened glass or sapphire – sapphire, in particular, is being touted as a cover glass for the next generation of mobile phones, production of which could potentially be a huge market for USP lasers. The advantage of ultrafast lasers is that they allow for very fine processing without putting any heat into the part. Pulse durations of picoseconds or femtoseconds remove material by a process called cold ablation, whereby the energy put into the work piece vaporises the material without any residual heat dissipating into the part. With ultrashort pulses it’s possible to cut metals but also organic materials without significant heat input. Take the example of scribing brittle materials like chemically strengthened glass, which, according to Frank Gaebler, director of marketing at laser provider Coherent, is difficult to achieve with other cutting methods. A USP laser, on the other hand, produces the cut without any heat effects such as cracks. ‘This can be achieved at speeds of metres per second,’ Gaebler said. In electronics, thin foils have been shown to be cut with USP lasers as an alternative to electrical discharge machining (EDM). Laser company Jenoptik has demonstrated cutting of copper foils in its application lab with a 10W femtosecond laser, the JenLas Femto 10, and a galvanometer scanner. 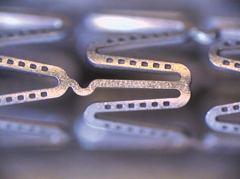 In these trials, laser cutting was shown to be faster than EDM. ‘Speed of processing is the main reason why our customers from electronics ask for laser cutting of copper foils,’ explained Nikolas von Freyhold, product manager of femtosecond lasers at the lasers business unit of Jenoptik’s lasers and material processing division. Sheets of copper 20µm to 40µm thick were cut into narrow bars around 1cm long and 20µm wide for demonstration purposes. Real parts will have shapes more complex than straight lines, noted von Freyhold, but the requirements for the cutting process are the same. Customers need the parts in large quantities, so a foil of several square centimetres is sliced with cut lines. The cuts have to be very exact, von Freyhold said, with sharp edges and without any burr. The walls also have to be nearly rectangular to the surface, so close to 0° taper angle, which required precession trepanning laser scanners. The process also has to have negligible heat affected zone (HAZ). To reach the required process speed, several watts of laser power were used, with care taken to avoid burning the parts – it is difficult to machine the foils with a nanosecond pulsed laser, for example, as longer pulses would put too much heat into the material. A femtosecond laser operating at around 500fs was used in order to work in the cold ablation regime and not distribute any heat into the bulk material. ‘By optimising laser and process parameters like repetition rate, pulse energy and feed speed of the motion system, you can cut these very narrow bars. This is astonishing because such a delicate structure is so easily deformed by temperature effects. We don’t have these effects – there’s no distortion of the bar,’ von Freyhold commented. Cold ablation requires pulse lengths below the material-specific phonon-electron relaxation times. For copper, these are in the range of 1ps, so a pulse duration shorter than this will vaporise the copper without any residual heat input. This is why pulse durations of 500fs were used in this instance, as opposed to picosecond pulses. In addition, von Freyhold noted that a femtosecond pulse with 50µJ of pulse energy, for example, has a higher ablation rate than a picosecond pulse with the same pulse energy. This means that with the same pulse repetition rate and the same pulse energy, a higher ablation rate is achieved with femtosecond pulses than with picosecond pulses – von Freyhold said that this was around a factor of two to four times higher. ‘This effect is not fully understood at the moment and is still being investigated by various research groups,’ he commented. This reliability now extends to femtosecond lasers as well as picosecond systems, according to von Freyhold. Jenoptik has sold femtosecond lasers since 2006. Its femtosecond and nanosecond lasers are based on diode-pumped thin disk lasers, which give excellent beam focusability, pointing stability and power stability, crucial for reproducible machining results in industrial operation. However, the technology is still relatively new and there are still some challenges to overcome. Firstly, according to Gaebler, the handling systems require development to make the most of higher power ultrafast systems while retaining the non-thermal effects of the pulses. Ultrafast lasers are available at average powers up to 1kW. ‘With ultrafast laser processing, you still have to operate within a certain pulse energy to optimise the process. This is why high power ultrafast lasers are operated at high repetition rates and minimal pulse overlap,’ Gaebler explained. An optimal beam steering system for high powers might use polygon scanners or beam splitting, for instance. ‘There’s lots of research being done in this area to make use of the high laser powers,’ Gaebler said. It’s not only the laser source or the beam handling systems that require development, but also the process as a whole. The success stories of stent cutting or drilling engine injection nozzles show that the technology is mature enough for industry, but applications of ultrafast lasers still require a lot of process development, according to von Freyhold. Jenoptik has worked on many applications using ultrafast lasers in addition to cutting copper foils. One such process the company has developed is for cutting leather with femtosecond pulses for an automotive application. The leather is used for interior lining in high-end cars, including the airbag covers. The underside of the leather is perforated along pre-determined break lines for the airbag to burst through on activation, while the front side of the cover remains intact. ‘This is perfectly done with femtosecond lasers, as you don’t want to burn the leather with heat input and you need to have very precise control of the scribing depth,’ von Freyhold explained. The leather is 1-2mm thick with the cut penetrating deep into the cover but not all the way through, leaving approximately 0.1mm material on the front side. This gives a defined break load for the break line while keeping the cuts invisible from the front side. The cuts also have to remain hidden over the lifetime of the car, which could be 20 or 30 years. ‘This is a very tricky but also a smart process and it works either with mechanical knives or with femtosecond lasers,’ von Freyhold said. ‘You can’t use any other kind of laser than a femtosecond laser, since any longer pulses would bring in too much thermal damage and visible break lines on the front side. ‘The problem with mechanical tools is that the process is really slow,’ he added. ‘The femtosecond laser is much faster, which is a big advantage.’ In addition, the laser process can handle different leather colours with only minimal change of parameters, von Freyhold noted, the reason being the non-linear absorption of femtosecond pulses. Jenoptik has a patent on this leather-scribing process using a femtosecond laser. 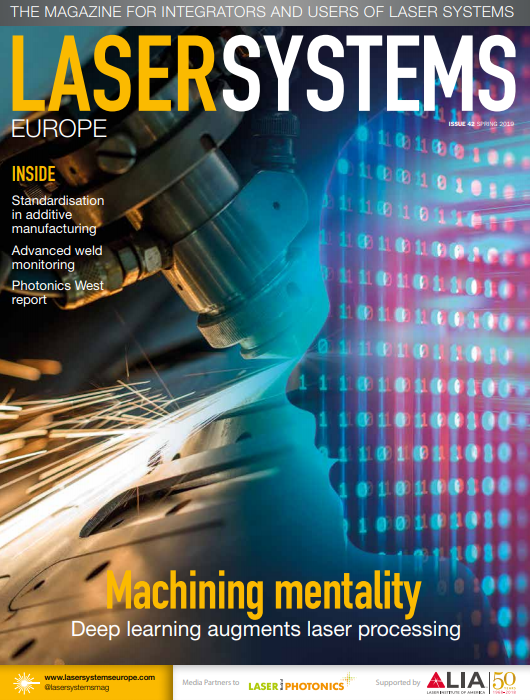 To receive future issues of Laser Systems Europe, subscribe here for free.